The Design Discovery Framework is the product of many years of trial and error with real people. It is a functional system built as a holistic process meant to help you awaken and apply your design. 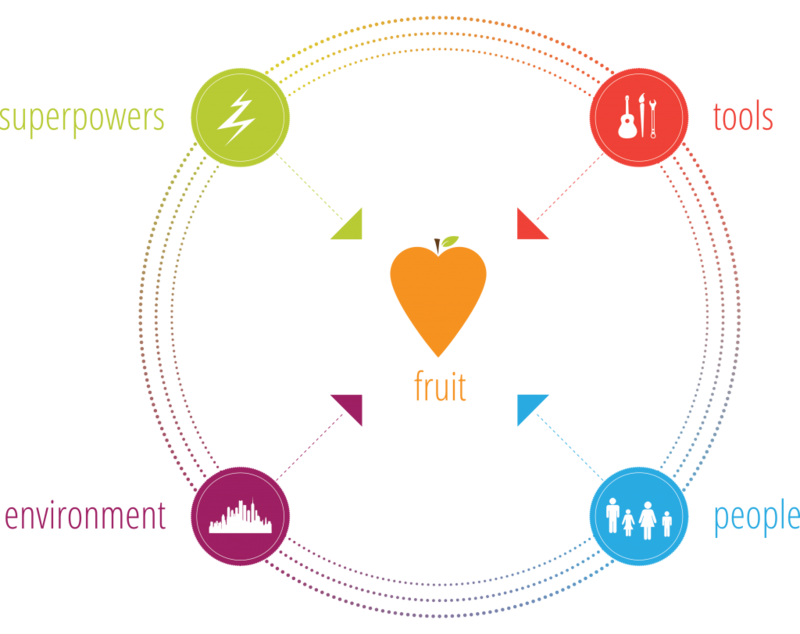 The framework helps you name your Superpowers, Environment, Tools, People, and Fruit you create in this world. Once you do the deep work of naming these areas, you will have gone a long way towards stepping into your design as the process is designed to clarify and heal by the powerful process of naming who you are. Your Superpowers are your supernatural abilities, the work or activity you love to do, your actual exertion of energy that creates change in the world, along the developmental stages in the movement of a culture of an idea. Superpowers are commonly known as your unique abilities or strengths. You may or may not be skilled at your Superpowers because you may not have experience with them yet, so fear not if you don’t have a resume to back it up! Your Superpowers have creative power – everything you do has never been done before, it is an act of creation, you are forging a world that does not exist yet. “What am I designed to do in this world?” It is built off of a derivation of the five-fold model of developmental maturity. The intangible and tangible subjects, objects, or props we use as a means or aide to do our work. “What do I use as a means to do what I am designed to do? The where you engage your design. Think about this as the context or location in which you do your work… all that needs to be in place around you to feel motivated to do your work. In general it contains all of the external influences that you need in place to be in your design. “Where do I specifically do my thing in the world and where do I typically find my people? These are the people you are called to engage with your design. More than just your target market or audience (though they are that), they are the ones you are destined to serve. Some of them will find you in your life and you are also called to go looking for them, sometimes even taking risks for them as you have something to offer them that is profound, unique, and meant for their soul. Who am I specifically designed to engage that benefits most from what I offer? This is what you produce, make, or accomplish, the end product, end result, or what you want to see happen as a result of your engagement. This is also what you make or what you after at the end of when you do your thing, the end result of what you offer. When you walk away from having done your creating work this is left behind, the creation. Fruit can be tangible or intangible. Interested in Becoming Clear on Your Design with our Framework?